The Royal Dutch Mint have launched (15th August) two new coins in celebration of the Peace Palace (Dutch: Vredespaleis)– which celebrates its centennial anniversary during the month of August. The monumental Peace Palace, built in neo-Renaissance style, was inaugurated on the 28th August 1913 by HM Queen Wilhelmina. The immense and impressive building houses the International Court of Justice, the Permanent Court of Arbitration, the Library of Peace and The Hague Academy of International Law. Every day, thousands of people work in more than 160 international organizations towards a safer and fairer world. This means that the Peace Palace itself has been regarded as the beating heart of The Hague as the city of Peace and Justice – not just of the Netherlands but all over the world. Since the Palace’s opening 100 years ago, it has grown into a global symbol of Peace and Justice. The anniversary will be celebrated between the 28th of August and 21st of September, the UN Day of Peace, with a range of events to remind us that we have to continue to work towards a peaceful world. The Palace of Peace is truly a center of excellence in this field with numerous world leaders, lawyers, diplomats and students visiting The Hague each year in pursuit of peace and justice the world over. The gold and silvercoins, which are the work of designer Thom Puckey, are struck at the Royal Dutch Mint in Utrecht. 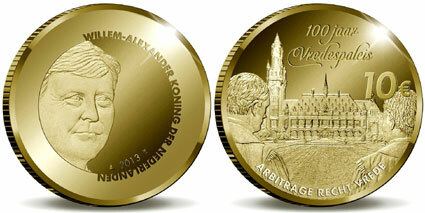 These are only the second commemorative coins issued after the accession of HM King Willem-Alexander who succeeded his mother Queen Beatrix on the 30th April. The king’s portrait is seen positioned to the left side of the coin within a wider circle, his front-facing portrait is seen at a slight angle to show a depiction which is not front-facing in full. In a semi-circle around the portrait is the text “WILLEM-ALEXANDER KONING DER NEDERLANDEN” forming part of the wider circle. The year of issue “2013” is placed just to the right of the portrait within the enclosed field. The reverse side captures the extravagant, decorative and exuberant interior and architecture of the Peace Palace. The palace itself is depicted as viewed from the front – in fact, the coin cleverly includes two spectators admiring the beautiful building on each side. The words “ARBEID RECHT VREDE” (Arbitration, Justice and Peace) are placed just below the primary design in along the lower edge. Just above the Palace’s depiction, is the stylized text “100 JAAR VREDESPALEIS” in two lines. The coin’s denomination is seen just to the right of the primary design. The coins are officially issued on the 26th August but can be ordered now for dispatch after the issue date. For more information on these and other coins offered by the Royal Dutch Mint, please visit their website at: http://www.knm.nl/Nieuws/nl/page/178/ Information offered in Dutch – orders dispatched to European addresses only. Recently received the silver proof version of the Peace Palace centennial. The detail of the palace itself on the reverse is refreshingly detailed and intricately engraved. Perhaps its the Royal Dutch Mint’s return to a more traditional design – together with their technological know-how, I expect to see some exceptional designs and craftsmanship where the coins of the new King are concerned. I can’t help but think that this coin would have been even more appealing had it been crown-sized, I do hope the Mint will consider a new larger silver series for future anniversaries and national events.